China’s ore resources are very rich. With the development of China’s economy, a large number of ore resources can be applied. The use of ore resources requires the use of ore processing machinery and equipment, such as the common jaw crusher, impact crusher and sand washing. Machines, feeders, conveyors, etc. are all very common processing machinery for ore processing. 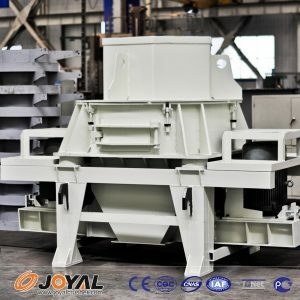 Shanghai Joyal Mining Machinery is a professional manufacturer of ore processing machinery and equipment. Joyal here and everyone talk about pcl for sand production. Sand making machine. The pcl sand making machine has been well known by customers for its convenient maintenance, convenient operation, economical and practical features. It is a low-input and high-return ore crushing equipment. However, Zhuoya reminds the users that there are many precautions when using this processing equipment. Today, Zhuoya will introduce to you what should you pay attention to when using the pcl sand making machine for sand processing of ore? When using the pcl sand making machine, it is necessary to pay attention to whether or not the material containing a large hardness such as metal is doped when adding the stone. When the inner cavity of the pcl sand making machine is heard, the sound is stopped immediately. It is best to arrange circular vibrating screens and screening equipment in the gravel production line to avoid uneven smashing, card machine, etc. ; the quantity and degree of materials are also required, and do not exceed the maximum of the pcl sand making machine. The amount of material and the highest degree of feed should be prevented from occurring. Joyal reminds everyone to pay attention to the interior of the high-efficiency pcl sand making machine. Always check the bolts and pin shafts of the sand making equipment, and check and remove all unstable factors. Users need to check the pcl sand making machine regularly. If the discharge port is used, if it is found to be blocked, the blockage must be removed immediately to ensure the normal discharge of the aggregate.